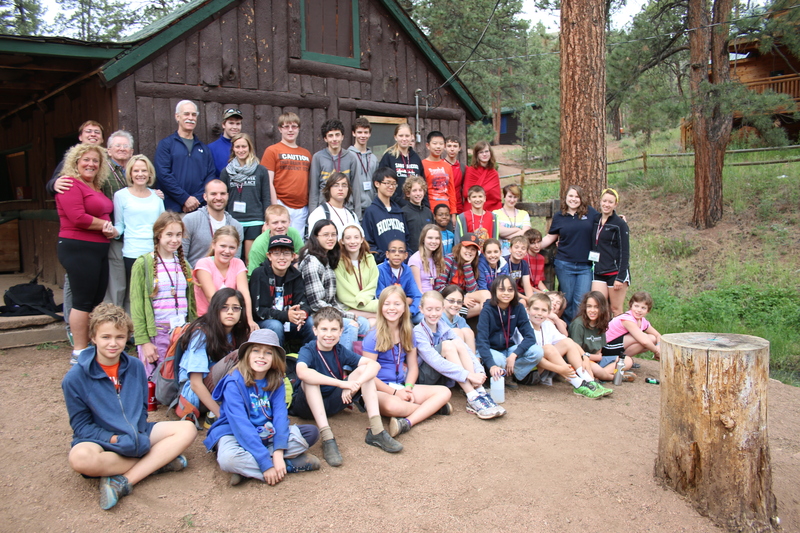 IEA’s pioneering Yunasa and Yunasa West summer camps unite highly able youngsters and experts in the social and emotional development of gifted children. Campers explore and grow the intellectual, spiritual, emotional, social, and physical aspects of their lives. 2012 was the inaugural year for Yunasa West, which took place June 10-17 in Sedalia, Colorado. There was a lot of excitement and some uncertainty going into Yunasa West – how would our beloved Yunasa camp work in the Rocky Mountains instead of on the shore of a Midwestern lake? Would the altitude prove challenging for our campers? Though there were a number of questions going into Yunasa West, coming out of it there is only affirmation. The week was a rousing success. Our campers were challenged intellectually and supported emotionally. They engaged in social, creative, and fun activities throughout each day and had formed a true “Yunasa family” by the end of the week. Low ropes worked as a team building exercise where campers had to communicate and lead each other across the ropes to reach a final destination. Druidawn, a creative writing and role playing summer camp, captivated all the campers with the task of creating mythological worlds and the characters that reside there. Campers enjoyed the challenge of coming up with original settings and creatures! On Friday, the girls initiated a zombie princess party that was a huge success! “Gaga ball” was a huge hit for campers. A few of them played every day of camp. 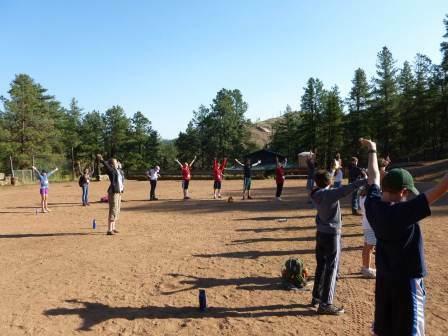 During one of Dan’s workshops, campers were taught to make a labyrinth with rocks they collected from around camp. By the end of the week, the labyrinth was complete—a 30 by 30 foot wonder in which campers, Fellows, staff, and visitors could walk through meditatively. Each day of camp began with a “Call in the Directions.” On the final day of camp, we did this at the labyrinth and set an intention for the campers as they parted ways. It was a special time of reflection. Terry Bradley came up to camp for a day to have students make a craft that represented the stressors in their lives and what strategies they use to deal with the stress. Terry also offered a chat in which she told about her life. She was greatly received and appreciated by the campers. Campers thoroughly enjoyed singing silly campfire songs. Open mic night was another time of laughs, applause and appreciation for one another. One of the campers told an original mystery story that gave everyone goose bumps. Our gratitude ceremony, part of our closing activities, was almost 45 minutes of the campers spontaneously sharing their memories of joy and fun and gratitude over the week. It felt like a culmination of the week – everyone celebrating their memories and experiences together, with many, many campers pledging to return for future years. It was a pleasure and an honor to see a community develop among these unique, thoughtful, shining-eyed campers as the week unfolded! Although 2012 marks the first year of Yunasa West, the camp still captured and relied on the deep-rooted traditions and values of the Yunasa family. Campers were encouraged by staff, counselors, and Fellows to explore the five aspects of Self: body, mind, spirit, heart, and social self. Many of the campers immediately felt comfortable with each other and were even surprised by the level of comfort they experienced with one another. It was an absolute joy to watch these kids as they made new friends, participated in camp activities and games, connected with the Fellows, and shared honest conversation with each other. The level of intelligence, maturity, and emotional depth among the campers was inspiring. Our hope is for these campers to return home feeling encouraged, accepted, alive to themselves and the possibilities, and maybe a little exhausted from all the fun! Also, be sure to check out the photos from camp! What were your kids’ favorite parts of Yunasa West? Please share with us in the comment section below!